The world's most visited museum, the Louvre in Paris, is to close on Friday amid worsening flooding caused by days of torrential rain. Another much-visited attraction, the Musee d'Orsay, shut its doors on Thursday. The town's Loing river, a tributary of the Seine, now has levels not seen since the devastating floods of 1910. "The electricity doesn't work, and we can't use our toilet because the sewers are also getting flooded," she said. "My home hasn't been flooded yet, but the water has already reached the garden, and it's still raining. We're going to leave before we get stuck here." 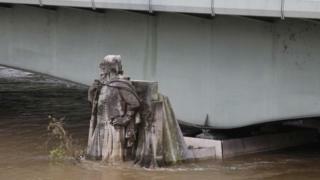 Six weeks' worth of rain has fallen in three days in the Loiret department. It submerged roads, forcing drivers to abandon their cars.